Mrs. Claus (also known as Mother Christmas in the UK, as a counterpart to Father Christmas) is the wife of Santa Claus, the Christmas gift-bringer in American and European Christmas tradition. She is known for making cookies with the elves, caring for the reindeer, and preparing toys with her husband. Her first name is a mystery, though she has been referred to as Mary, Annalina, Jessica, Layla, Ahoop, Seeki, Martha, Kasey, Juliana, Gretchen, Annabel, Santarina, Emily, and Bae. The wife of Santa Claus is first mentioned in the short story "A Christmas Legend" (1849), by James Rees, a Philadelphia-based Christian missionary. In the story, an old man and woman, both carrying a bundle on the back, are given shelter in a home on Christmas Eve as weary travelers. The next morning, the children of the house find an abundance of gifts for them, and the couple is revealed to be not "old Santa Claus and his wife", but the hosts' long-lost elder daughter and her husband in disguise. [I]n bounded that jolly, fat and funny old elf, Santa Claus. His array was indescribably fantastic. He seemed to have done his best; and we should think, had Mrs. Santa Claus to help him. An account of a Christmas musicale at the State Lunatic Asylum in Utica, New York in 1854 included an appearance by Mrs. Santa Claus, with baby in arms, who danced to a holiday song. A passing references to Mrs. Santa Claus was made in an essay in Harper's Magazine in 1862; and in the comic novel The Metropolites (1864) by Robert St. Clar, she appears in a woman's dream, wearing "Hessian high boots, a dozen of short, red petticoats, an old, large, straw bonnet" and bringing the woman a wide selection of finery to wear. "There was a lady sitting by a golden desk, writing in a large book, and Santa Claus was looking through a great telescope, and every once in a while he stopped and put his ear to a large speaking-tube. “‘Two bad ones for Isaac Clappertongue; he’ll drive his mother to the insane asylum yet.’"
Effie sank back in the chair to think. She wished Lill had found out how many black marks she had, and whether that lady was Mrs. Santa Claus—and had, in fact, obtained more accurate information about many things. She was dressed for traveling and for cold weather. Her hood was large and round and red but not smooth, — it was corrugated; that is to say, it connsisted of a series of rolls nearly as large as my arm, passing over her head sidewise, growing smaller toward the back until they terminated in a big button that was embellished with a knot of green ribbon. Its general appearance was not unlike that of the familiar, pictorial beehive except that the rolls were not arranged spirally. The broad, white ruffle of her lace cap projected several inches beyond the front of the hood and waved back and forth like the single leaves of a great white poppy, as she nodded emphatically in her discourse. Her outer garment was a bright colored plaid worsted cloak reaching to within about six inches of the floor. Its size was most voluminous, but its fashion was extremely simple. It had a wide yoke across the shoulders, into which the broad plain breadths were gathered; and it was fastened at the throat by a huge ornamented brass hook and eye, from which hung a short chain of round twisted links. Her right arm protruded through a vertical slit at the side of the cloak and she held in her hand a sheet of paper covered with figures. The left arm on which she carried a large basket or bag — I couldn't tell which — was hidden by the ample folds of the garment. Her countenance was keen and nervous, but benignant. Mrs. Claus proceeds to instruct the architect Gardner on the ideal modern kitchen, a plan of which he includes in the article. Santa Claus' wife made her most active appearance yet by Katharine Lee Bates in her poem "Goody Santa Claus on a Sleigh Ride" (1889). "Goody" is short for "Goodwife", i.e., "Mrs."
In Bates' poem, Mrs. Claus wheedles a Christmas Eve sleigh-ride from a reluctant Santa in recompense for tending their toy and bonbon laden Christmas trees, their Thanksgiving turkeys, and their "rainbow chickens" that lay Easter eggs. Once away, Mrs. Claus steadies the reindeer while Santa goes about his work descending chimneys to deliver gifts. She begs Santa to permit her to descend a chimney. Santa grudingly grants her request and she descends a chimney to mend a poor child's tattered stocking and to fill it with gifts. Once the task is completed, the Clauses return to their Arctic home. At the end of the poem, Mrs. Claus remarks that she is the "gladdest of the glad" because she has had her "own sweet will". Since 1889, Mrs. Claus has been generally depicted in media as a fairly heavy-set, kindly, white-haired elderly female baking cookies somewhere in the background of the Santa Claus mythos. She sometimes assists in toy production, and oversees Santa's elves. It is worth noting that, when not portrayed as white-haired or elderly, she is often shown to have red hair. This could be because red hair is the color that most commonly fades to white with age. She is usually depicted wearing a fur dress of red or green. Her reappearance in popular media in the 1960s began with the children's book How Mrs. Santa Claus Saved Christmas, by Phyllis McGinley. 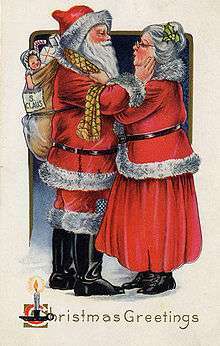 Today, Mrs. Claus is commonly seen in cartoons, on greeting cards, in knick-knacks such as Christmas tree ornaments, dolls, and salt and pepper shakers, in storybooks, in seasonal school plays and pageants, in parades, in department store "Santa Lands" as a character adjacent to the throned Santa Claus, in television programs, and live action and animated films that deal with Christmas and the world of Santa Claus. Her personality tends to be fairly consistent; she is usually seen as a calm, kind, and patient woman, often in contrast to Santa himself, who can be prone to acting too exuberant. Mrs. Claus has appeared as a secondary character in children's books about Santa Claus and as the main character in titles about herself. Annalina: The Untold Story of Mrs Claus by Adam Greenwood, 2011, tells the tale of the young woman who will one day become Mrs Claus. It has been adapted into a story book for young children with coloring pictures and serves as the pilot for a series of novellas about various different characters from the story. Mrs. Claus Says by Nancy Claus, 2005–present, an ongoing series of children's books about life in the North pole, narrated by Mrs. Claus. The first motion picture to depict Mrs. Claus was 1964's Santa Claus Conquers the Martians, where she was played by Doris Rich. In the 1984 Tri-Star movie, The Night They Saved Christmas, Mrs. Claus, as played by June Lockhart to Art Carney's Santa, looked after the children when they visited the North Pole. Mrs. Claus (played by Judy Cornwell) is also a character in 1985's Santa Claus: The Movie, where she played a vital role in the film's story. It was her idea to give presents only to good children. In the 1993 movie The Nightmare Before Christmas, Mrs. Claus has a cameo appearance. She is seen in the kitchen of her and Santa Claus's home, preparing a lunch box and a vacuum flask for her husband to take to work. The 2002 movie The Santa Clause 2 centers on Tim Allen's character being forced to marry in order to continue his role as Santa. The "Mrs. Clause" confirms why every Santa has had a Mrs. Claus, because it is part of the Santa Clause. He ultimately finds genuine love in Carol Newman (Elizabeth Mitchell), the principal of his son Charlie's school, and in The Santa Clause 3: The Escape Clause, she deals with being Mrs. Claus, having a baby, and being separated from her family. Played by Miranda Richardson in the 2007's Fred Claus (2007) starring Vince Vaughn and Paul Giamatti. Her name is Annette. In Arthur Christmas, Mrs. Claus' first name is Margaret and is the wife of Malcolm (the current Santa) and mother of both the title character Arthur and his older brother Steve. She is depicted as much more efficient than her husband. Mrs. Claus played a major role in several of Rankin/Bass' Christmas specials. In Santa Claus is Coming to Town (1970), she is introduced as a teacher named Jessica, who first meets Santa Claus (then known as Kris Kringle) as a young man, when he's trying to illegally deliver toys to a town run by a despotic ruler. She assists him, and thus becomes a wanted fugitive herself with Kringle and his confederates. In light of this sacrifice, Jessica and Santa soon fall in love with each other, and marry in the nearby forest. In 1974's The Year Without a Santa Claus and the 2006 live action remake, Mrs. Claus played a large role, as she attempts to show Santa (who wishes to stay home that year for Christmas when he feels no one appreciates or believes in him anymore) that there's still some Christmas spirit left in the world. Mrs. Claus also made appearances in several other Rankin/Bass specials. In Rudolph the Red-Nosed Reindeer (1964), she is seen as pestering her husband to eat, lest he become a “skinny Santa,” and in Rudolph and Frosty's Christmas in July (a movie that unites characters from Rudolph and Frosty the Snowman, among other Rankin/Bass Christmas specials), Santa calls her "Jessica" at one point. The lady was also portrayed in a television musical, Mrs. Santa Claus (1996), played by Angela Lansbury, with songs by Jerry Herman. Neglected by her husband, she goes to New York in 1910, and gets involved in agitating for women's rights and against child labor in toy manufacturing. Of course, she gets to learn how "Santa misses Mrs. Claus", as the sentimental song lyrics have it. She goes by the name of Anna. One of Mrs. Claus's most unusual television appearances is in The Grim Adventures of Billy & Mandy Christmas special Billy and Mandy Save Christmas. In this story her name is Nancy and she is a powerful vampiress who, angry that Santa leaves most of the work for her, turns him into a vampire so she can take a break (which is about the six or seventh time she's done so), when she gets the idea from Mandy to try and take over the world before Billy reconciles them. Another unusual appearance is in the Robot Chicken Christmas Special, during which, in a Dragon Ball Z parody sketch, she gains powers from the North Pole's radiation, and becomes a giant monster that Goku, Gohan, and Rudolph must destroy. In A Charlie Brown Christmas, Charlie Brown's sister Sally writes to Santa and asks, "How is your wife?" Later, in It's Christmastime Again, Charlie Brown, she writes Santa's wife herself, and, when Charlie Brown comments that some people call her "Mary Christmas," Sally congratulates her on choosing to keep her own surname. In Charlie Brown's Christmas Tales, Sally writes Santa Claus as "Samantha Claus", inadvertently thinking Samantha Claus is Santa Claus's wife. Mrs. Claus appears in A Chipmunk Christmas, where she buys Alvin a harmonica after he gives his old one to a sick boy. Her identity isn't revealed until the end, when Santa returns home and she greets him. Boost Mobile created some controversy with an ad featuring Mrs. Claus in bed with a snowman. One version was briefly aired on late-night TV while two alternate versions were posted online. Ad Age had some commentary about the spot, including “This latest ad from Boost Mobile and agency 180, Los Angeles, features Mrs. Claus doing something very, very bad.“  Fox News commentator Bill O'Reilly, CNN and a number of local TV news channels commented about the ads. It may perhaps be one of the first popular culture depictions of Mrs. Claus in a less than idealistic manner, at least on television. Janet McTeer as Mrs Claus in the M&S marketing campaign. For 2016, British clothing and food company Marks & Spencer launched an integrated marketing campaign centered on a modern interpretation of Mrs. Claus. The campaign included a three-minute ad released on 11 November 2016 which sees Mrs. Claus receiving a letter from a seven-year-old child asking for help with a gift for his older sister, whom the boy has a difficult relationship with. The ad depicts Mrs Claus as more modern than previous examples, with her riding a snowmobile and flying a helicopter while Santa is out delivering gifts in the traditional sleigh. At the conclusion of the ad, she says to Santa “Well it wouldn’t be fun if you knew all my secrets” suggesting she has a secret life assisting with Christmas present delivery. The brand also created a social media campaign in which Mrs. Claus answered requests and questions from members of the public. The ad was received positively by customers and the press with many people commending the brand for taking a feminist approach to a traditional character. The ad was directed by Academy-award winner Tom Hooper with Mrs Claus played by British actress Janet McTeer. Music was composed by Rachel Portman. The ad was created for Marks & Spencer by advertising agency Rainey Kelly Campbell Roalfe, a London-based division of Young & Rubican. In 1953 Nat King Cole had a single released The Little Boy That Santa Claus Forgot, featuring on the flipside his rendition of a song, Mrs. Santa Claus, with accompaniment by Nelson Riddle's orchestra. In contrast to her stereotypical portrayal, Mrs. Claus is portrayed as a woman bored with her relationship with Santa Claus in the song Surabaya-Santa from Jason Robert Brown's musical Songs for a New World and in the Oszkars' off-color song Mrs. Claus has a Headache Again. In 1987, George Jones and Tammy Wynette released single Mr and Mrs Santa Claus, a love song sung by Jones and Wynette as Mr. and Mrs. Claus respectively. Bob Rivers recorded a parody of the soul classic "Me and Mrs. Jones," entitled "Me and Mrs. Claus," on his 2002 album White Trash Christmas. Bob Ricci recorded a parody of the pop hit "Stacy's Mom," entitled "Mrs. Claus." In Saints Row IV How the Saints Saved Christmas DLC, Mrs. Claus is appears along with her husband. He first name is revealed to be Mary. While she is mostly Santa's sweet, caring, and devoted wife, she is also tough, capable fighter ("decking the halls" as Santa puts it), and unlike her husband quick to reveal the truth behind the nature of the "North Pole", the changes in to standards of what is considered Naughty, what happened the one time Santa let someone else drive the sleigh with his reindeer, among other things. Her personality and additude even earns Mrs. C some respect from the Saints Boss. ↑ Humphreys, Stephen. Harold Saves Christmas. Authorhouse. ↑ Greenwood, Adam. "Annalina - The Untold Story of Mrs Claus". ↑ Muller, Romeo. "Santa Claus is Comin' to Town (1970)". ↑ Guinn, Jeff (2006). The Autobiography of Santa Claus. New York: Jeremy P. Tarcher/Penguin. ISBN 978-1-101-12777-3. ↑ "Mrs. Santa Claus (1985)". ↑ "The Night They Saved Christmas (1984)". ↑ Steven Whitestone & Rachel Koretsky. "The Story of Santa Claus (1996)". ↑ James Rees, Mysteries of City Life, J. W. Moore, 1849, p. 1. ↑ "Holiday Week", The Yale Literary Magazine, vol. 17, December 1851, p. 82. ↑ "Santa Claus", The Opal, vol. 4, no. 1, 1854, p. 27. ↑ "Editor's Easy Chair", Harper's, vol. 24, no. 141, February 1862, p. 411. ↑ Robert St. Clar, The Metropolites, New York: American News Company, 1864, p. 37CHICKEN POT PIE9. ↑ E. C. Gardner, "A Hickory Back-Log", Good Housekeeping, vol. 4, no. 6, January 22, 1887, p. 125. ↑ Penne L. Restad, Christmas in America: A History, Oxford University Press, 1996, p. 148. ISBN 978-0-19-510980-1. Although Restad gives the publication year as 1899, most sources say the poem was published in 1889. ↑ "Goodwife" and "Goody", The American Heritage Dictionary of the English Language, 4th ed. ↑ Wheaton, Ken (2009-12-01). "Mrs. Claus Gets Frigid in Naughty Boost Mobile Ad | Advertising and Marketing Wisdom: Adages - Advertising Age". Adage.com. Retrieved 2012-12-24. ↑ Metro.co.uk, Olivia Waring for (2016-11-11). "The 2016 M&S Christmas advert about Santa's wife totally sleighs John Lewis". Metro. Retrieved 2016-11-22. ↑ "All hail Mrs Claus! How the M&S Christmas ad went fully feminist". The Telegraph. Retrieved 2016-11-22. 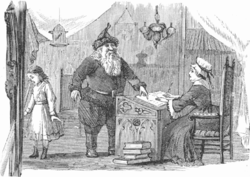 Wikimedia Commons has media related to Mrs. Claus. Goody Santa Claus on a Sleigh-Ride, 1889, by Katherine Lee Bates, original edition and text.